ServerTech’s Smart Cabinet Distribution Unit (CDU) provides reliable power distribution combined with local and remote power monitoring and environmental monitoring via IP. 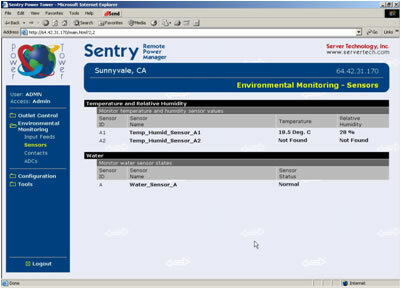 Use the network interface to view power, temperature and humidity levels via Web browser, or receive SNMP-based alarms and email alerts when conditions exceed defined thresholds. Flexible Mounting Options– Zero-U button or bracket mounting for mounting vertical CDU’s in the back or on the side of the cabinet to avoid consuming valuable “U” space. Branch Circuit Protection– All Sentry CDU’s meet the UL 60950-1 requirement for branch circuit protection and use either fuses or circuit breakers to protect each branch of outlets. Input Current Monitoring– The CDU’s exclusive True RMS Current Monitoring is critical to preventing overloads in high-density computing environments. Digital LED displays on the CDU enclosure report the input current of each phase or branch circuit. Environmental Monitoring– External probes, with 3-meter cable, capable of measuring temperature & humidity. Receive SNMP-based or email alert notifications when conditions exceed defined thresholds. Expansion Module– Exclusive method for linking additional outlets, on separate CDU’s, together under a single IP address, with support for A & B power in-feeds. IP Access, Security & Communications– Web interface, SSL, SSH, Telnet, SNMP and RS- 232 access, 10/100 Base T-Ethernet, SSLv3/TLSv1, SNMPv2, TACACS+, LDAP, LDAPS, RADIUS, DHCP, SMTP/Email, and Syslog. Cable Retention Clips– Ensures power cords to the connected devices are not accidently unplugged or disconnected. High Density Outlet Technology (HDOT) provides up to 42 C13’s in a 42U high by 1U wide device, the highest possible outlet density available in a network connected PDU. Manufactured with robust high temperature materials carrying a UL94 V-0 flame rating makes these outlets ideally suited for harsh data center environments. Additional features include high native cord retention that eliminates the need for custom and costly ancillary locking cord devices. The Expansion Module CDU, Smart CL or Switched CX, is ServerTech’s exclusive method for linking together outlets on different power circuits.The Expansion Module CDU, CL or CX, increases the number of managed outlets on a single IP address. 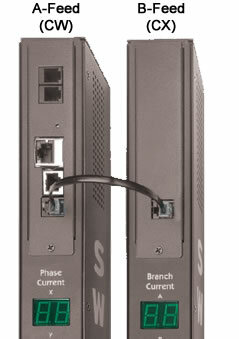 Each expansion module links to its parent Smart CS or Switched CW, which contains both network and serial interfaces. When linked to a Smart or Switched CDU, the CL’s or CX’s outlets are auto-discovered by the Smart or Switched CDUs firmware, and all available outlets are viewable through the firmware. Each Expansion Module CDU can be a single or dual-power feed and a Zero-U or horizontal enclosure.